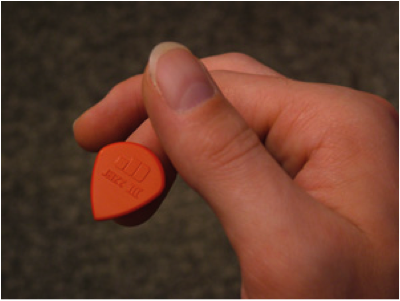 When first holding the guitar pick remember not to hold it too firmly, you the pick to glide over the strings with ease. 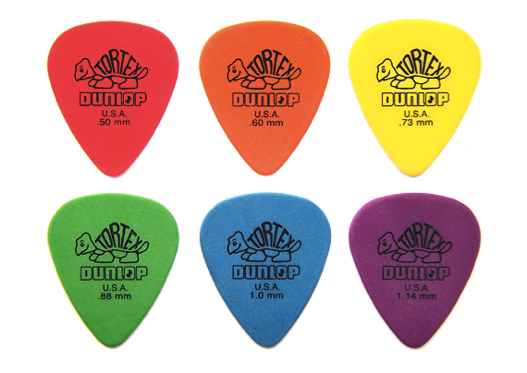 Guitar picks or plectrums come in all shapes, sizes and thicknesses, when choosing a pick at first try to choose one of a lighter thickness, as this will create less resistance against the strings. To begin holding the pick place the pick on the end of your first finger of your right hand if you are right handed or you left hand if you are left handed. 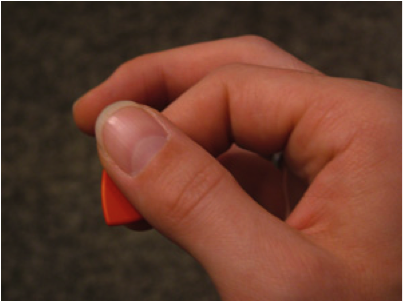 Make sure your finger is creating an arch as shown in the image and then bring your thumb over the top of the pick to grip it. (Remember not too firm), you want to be sure that the pointed edge is facing out in line with where your first finger is pointing. It is the pointed edge that you will be playing the strings with.